We explore the history of turntablism, from its primitive beginnings with travelling showmen right up to contemporary sound installations and the DMC. In fact the creative use of reproductive technology started early in the development of the equipment. From the mid-to-late 1800s, buyers of cylinder phonographs and graphophones were using the equipment not only to listen to pre-recorded music, but also to make their own vocal and instrumental recordings. 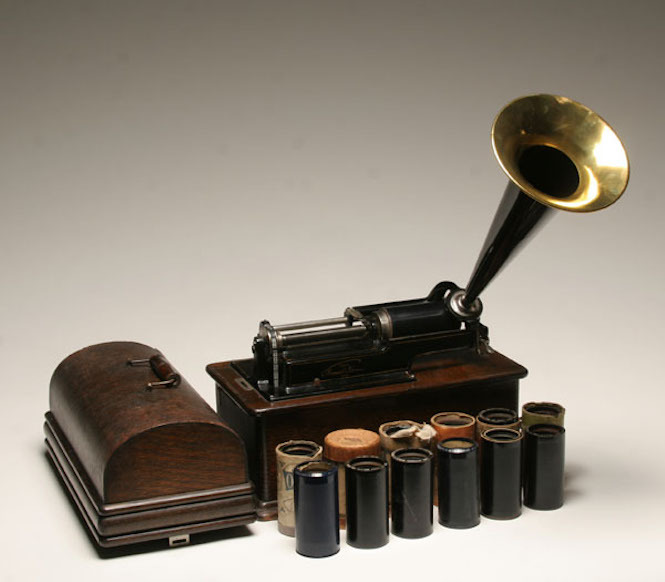 Both Edison’s phonograph and Bell-Tainter’s graphophone enabled sound recording as well as playback, with wax as the medium to allow the recording to be removed from the cylinder and stored for later listening. Although Edison didn’t foresee the creative and commercial potential of his invention, the first manipulation of recorded sound for the purpose of entertainment took place using his phonograph. Seventy years before hip hop turntablists, traveling showmen would, as the grand finale to an evening’s entertainment, instantly record a cornettist and then perform sped-up takes of the recording by turning the phonograph handle faster and faster. When a commercial version of Emile Berliner’s flat disc gramophone was introduced in 1895, both the phonograph and graphophone lost appeal because the new flat disc could support longer, better quality recordings than the cylinder. The disc gramophone, however, lacked home-recording technology – instead it was restricted to playing the records that were commercially available. With recording out, musicians began to experiment with the gramophone as a performing and composing device, and from this point we see the development of what we now call turntablism. Musicians from across the board began to experiment with the creative potential of the turntable, transforming it from a reproductive device and into to a musical instrument. The background to the creative musical use of the turntable falls into several distinct histories. The work of hip-hop pioneers and radio/club DJs is well documented, but the other earlier, and equally important history, lies outside popular music, in the field of experimental music and installation art. In the early part of the twentieth century, a handful of composers became interested in the creative potential of the phonograph or gramophone, and began undertaking small-scale experiments. Paul Hindemith’s Trickaufnahmen (trick recordings), for example, investigated the technical abilities of the gramophone as well as the performer with a range of sound manipulation techniques – including acceleration and deceleration of discs and the knock-on pitch changes, possibly even using two phonographs simultaneously. These experiments set the foundation for visual artists Moholy-Nagy and Christian Marclay and composers Pierre Schaeffer and John Cage; four major turntable pioneers emerging from a range of musical and artistic backgrounds. Moholy–Nagy, along with Oskar Fischinger and Paul Arma, attempted to alter the acoustic content of records before amplification by carving graphic structures into the grooves and running the record backwards against the stylus to scratch new patterns. Nagy hoped that his experiments with turntable music would result in the creation of a new musical language, through studying the graphic signs on the record. Pierre Schaeffer, pioneer of musique concrète, also experimented with manipulating recordings by playing them backwards and forwards, juxtaposing sounds taken from their original time continuum, playing recordings at different speeds, and creating repetitive sound loops by breaking the groove at specific points. Many contemporary turntablists manipulate the sound of records by creating repeating loops or ‘locked grooves’ and Schaeffer was the first to use this technique, pressing records with a groove that holds the stylus in a continuous cycle, looping the sound as the record rotates. This technique was used in Etude aux Chemins de Fer (1948) which was constructed from successive extracts of material made from manipulated recordings of steam locomotives at Gare des Batignolles, Paris. 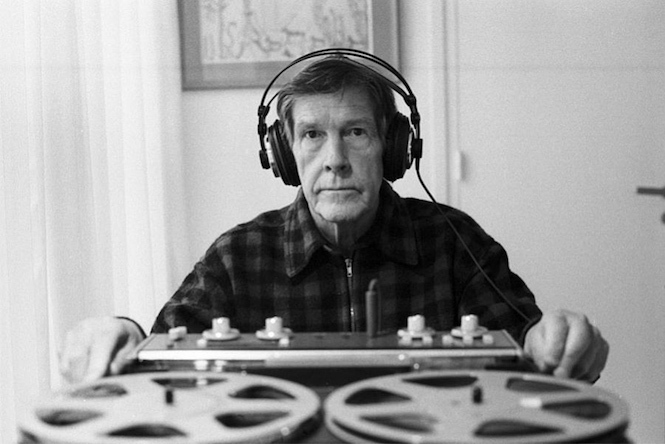 In John Cage’s Imaginary Landscape No.1 (1939), the records alternate between two speeds – 33 and 78 rpm – and rhythms are created by lifting and lowering the needle onto the record. Meanwhile in his work Credo in Us(1942) the player of the phonograph is instructed, “If phonograph, use some classic: e.g. Dvorak, Beethoven, Sibelius or Schostakovich” to add fragments of sound to the piece. His Imaginary Landscape No.5 (1952) work was composed for 42 records and 33 1/3 (1969) for twelve record players. This creative use of turntable technology also extended to the phonograph itself. In Cage’s Cartridge Music (1960), performers are directed to amplify small sounds using pick-ups taken from the tone arms of record players. The idea of the record as basis for production is later found in the turntable music of artist Christian Marclay – his tribute composition John Cage for example is a recording of a collage made by cutting slices from a number of records and gluing them together to form a single disc. 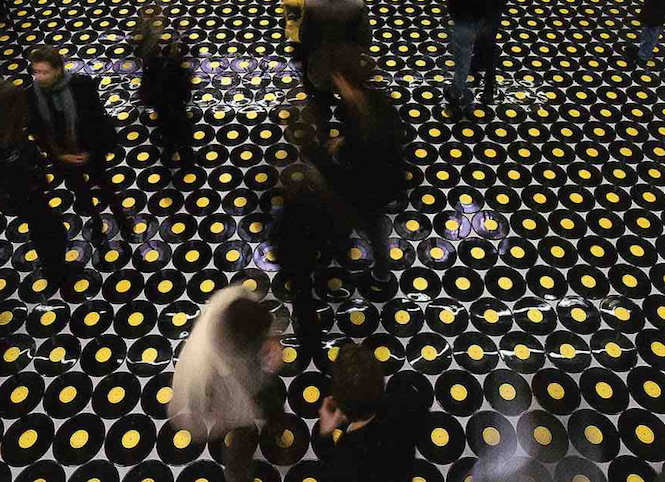 Marclay’s Footstepsalso explores the effects of physically altering the record – three thousand five hundred records were used as flooring at an art exhibition over six weeks, packed in individual covers and then sold. For Marclay, these experiments that alter and distort the original recording highlight his understanding of the record as a constantly changing capsule of sound and he deliberately brings the residual sounds of pops, clicks and scratches to the foreground of the composition. Meanwhile in ’50s and ’60s Jamaica, musicians began a radical relationship with records that transformed recorded music into a live event. Until 1995 Jamaica had limited music copyright laws, meaning that soundsystem and reggae DJs could use records for their own creative ends. Through EQ alterations, sound effects and vocals, as well as pioneering tricks like the ‘rewind’ (spinning back a record to be repeated), DJ created original compositions using rhythm tracks from popular records. Over in the States, early radio DJs played their part in developing turntable techniques. In order to enhance his promotions of records for example, Bill Curtis (veteran DJ for American station WUFO) began to manipulate the records he played, extending the record by slowing it down, repeating sections and/or talking over the track. The first DJ to introduce mixing, albeit in a primitive sense, was Terry Noel, resident DJ at the ’60s New York nightclub Arthur. Working with a relatively simple set-up (having only a volume dial for each turntable), Noel subtly mixed tracks in a way never heard before. Francis Grasso, resident disco DJ at The Sanctuary in New York, was arguably the first club DJ to manipulate recorded material for artistic purposes. Prior to Grasso’s turntable experiments DJs played records one at a time and club evenings lacked a cohesive flow due to the constant start-stop of three-minute records. Although Grasso was not the first DJ to mix two records together, he was the first to deliberately perfect beat mixing as a creative technique. In the 1970s, DJ Francis Grasso went on to introduce slip-cueing, which he had learnt from friends working as radio DJs. 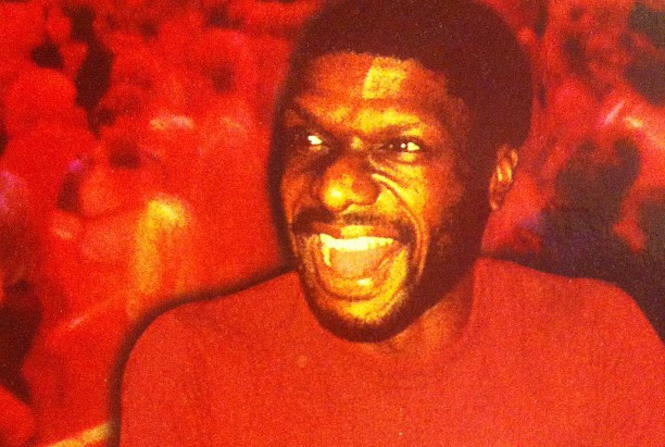 Not far away, at the Paradise Garage, Larry Levan perfected the practice of constructing music from many different sources, blending rock, pop, electronica, soul, rap, funk and disco and in a similar vein Frankie Knuckles incorporated sound effects into his sets at the Warehouse, Chicago. In an unconscious nod to Pierre Schaeffer’s Etude aux Chemin de Fer, Knuckles played an extended sound effect of a speeding steam train, panning the sound from the front to the back of the club, giving the effect of a train ploughing through the dance floor. During his time at the club Galaxy 21, Walter Gibbons developed turntable-based cut and paste techniques to manipulate small sections of drum breaks – the forerunner to the beat-juggling techniques used by contemporary hip hop turntablists. Walter Gibbons’ cut and pastes enabled him to construct small sections of music into an original whole at the turntable. The 1970s and early 1980s witnessed a club-based popular music revolution that took DJs from using one turntable to two, and sometimes three, decks. These innovations, taking place as they did on turntables, established the concept of the DJ as music creator rather than solely player of records. and paved the way for the sound manipulation techniques and compositional processes of turntablist musicians. The history of the turntable being used as a musical instrument has its roots dating back to the 1930s, 1940s and 1950s when musique concrète and other experimental composers (such as John Cage, Halim El-Dabh, and Pierre Schaeffer), used them in a manner similar to that of today’s producers and DJs, by essentially sampling and creating music that was entirely produced by the turntable. Cage’s Imaginary Landscape No. 1 (1939) is composed for 2 variable speed turntables, frequency recordings, muted piano & cymbal. Examples of turntable effects can also be found on popular records produced in the 1960s and 1970s. Creedence Clearwater Revival’s 1968 self-titled debut album features a backspin effect in the song “Walk on the Water”. However, turntablism as we know it now did not surface until the introduction of hip hop in the late 1970s. Turntablism as a modern art form and musical practice has its roots within hip hop and hip hop culture of the early 1970s. 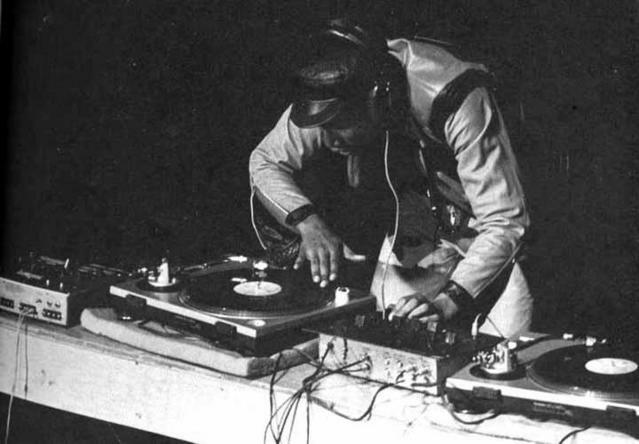 Scratching was already widespread within hip hop by DJs and producers by the time turntablists started to appear. Hip-Hop turntablist DJs use turntable techniques like beat mixing/matching, scratching, and beat juggling. Some turntablists seek to have themselves recognized as traditional musicians capable of interacting and improvising with other performers. Some focus on turntable technique while others craft intricate compositions by focusing on mixing. Kool DJ Herc, Afrika Bambaataa and Grandmaster Flash are widely credited for having cemented the now established role of DJ as hip hop’s foremost instrumentalist. Kool Herc’s invention of break-beat DJing is generally regarded as the foundational development in hip hop history, as it gave rise to all other elements of the genre. His influence on the concept of “DJ as turntablist” is equally profound. To understand the significance of this achievement, it is important to first define the “break.” Briefly, the “break” of a song is a musical fragment only seconds in length, which typically takes the form of an “interlude” in which all or most of the music stops except for the percussion. The break is roughly equivalent to the song’s “climax,” as it is meant to be the most exciting part of a song before returning once more to its finale (usually a return to the main chorus). In addition to raising the audience’s adrenaline level, the percussion-heavy nature of the break makes it the most danceable as well, if only for seconds at a time. Kool Herc introduces the break-beat technique as a way of extending the break indefinitely. This is done by buying two of the same record and switching from one to the other on the DJ mixer: e.g., as record A plays, the DJ quickly backtracks to the same break on record B, which will again take the place of A at a specific moment in which the audience will not notice that the DJ has switched records. Kool Herc’s revolutionary technique set the course for the development of turntablism as an art form in significant ways. Most important, however, he developed a new form of DJing that did not consist of playing and mixing records one after the other. The type of DJ that specializes in mixing is well respected for his own set of unique skills, but playlist mixing is still DJing in the traditional sense. Kool Herc instead originated the idea of creating a sequence for his own purposes, introducing the idea of the DJ as the “feature” of parties, whose performance on any given night would be examined critically by the crowd on both a technical and entertainment level. DJ Grand Mixer DXT is also credited with furthering the concept of scratching by practicing the rhythmic scratching of a record on one or more (usually two) turntables, using different velocities to alter the pitch of the note or sound on the recording (Alberts 2002). DXT appeared (as DST) on Herbie Hancock’s hit song “Rockit“. These early pioneers cemented the fundamental practice that would later become the emerging turntablist art form. Scratching would during the 1980s become a staple of hip hop music, being used by producers and DJs on records and in live shows. By the end of the 1980s it was very common to hear scratching on a record, generally as part of the chorus of a track or within its production. On stage the DJ would provide the music for the MCs to rhyme to, scratching records during the performance and showcasing his skills alongside the verbal skills of the MC. The most well known example of this ‘equation’ of MCs and DJ is probably Run DMC who were composed of two MCs and one DJ. The DJ, Jam Master Jay, was an integral part of the group since his turntablism was critical to Run DMC’s productions and performances. While Flash and Bambaataa were using the turntable to explore repetition, alter rhythm and create the instrumental stabs and punch phrasing that would come to characterize the sound of hip hop, Grandmaster DST was busy cutting “real” musicians on their own turf. His scratching on Herbie Hancock’s 1983 single, “Rockit”, makes it perhaps the most influential DJ track of them all – even more than (Grandmaster Flash’s) “Wheels of Steel”, it established the DJ as the star of the record, even if he wasn’t the frontman. Compared to “Rockit”, West Street Mob’s “Break Dancin’ – Electric Boogie” (1983) was punk negation. Only DJ Code Money’s brutal mangling of Schooly D’s early records can match the cheese-grater note-shredding of “Break Dancin'”. As great as Break Dancin’ was, though, it highlighted the limited tonal range of scratching, which was in danger of becoming a short-lived fad like human beat-boxing until the emergence of Code Money’s DJ Brethren from Philadelphia in the mid-’80s. Despite New York’s continued pre-eminence in the hip hop world, scratch DJing was modernized less than 100 miles down the road in Philadelphia. Denizens of the City of Brotherly Love were creating the climate for the return of the DJ by inventing transformer scratching. Developed by DJs Spinbad, DJ Cash money and DJ Jazzy Jeff, transforming was basically clicking the fader on and off while moving a block of sound (a riff or a short verbal phrase) across the stylus. Expanding the tonal as well as rhythmic possibilities of scratching, the transformer scratch epitomized the chopped-up aesthetic of hip hop culture. Hip hop was starting to become big money and the cult of personality started to take over. Hip hop became very much at the service of the rapper and Cash Money and DJ Jazzy Jeff, saddled with B-list rappers like Marvelous and the Fresh Prince, were accorded maybe one track on an album. For example, tracks like DJ Jazzy Jeff’s “A Touch of Jazz” (1987) and “Jazzy’s in the House” (1988) and Cash Money’s “The Music Maker” (1988). Other crucial DJ tracks from this period include Tuff Crew’s DJ Too Tuff’s “Behold the Detonator” “Soul Food” (both 1989),” and Gang Starrs “Dj Premier in Deep Concentration” (1990). The appearance of turntablists and the birth of turntablism was prompted by one major factor – the disappearance of the DJ in hip hop groups, on records and in live shows at the turn of the 1990s. This disappearance has been widely documented in books and documentaries (such as Black Noise and Scratch The Movie), and was linked to the increased use of DAT tapes and other studio techniques that would ultimately push the DJ further away from the original hip hop equation of the MC as the vocalist and the DJ as the music provider alongside the producer. This push and disappearance of the DJ meant that the practices of the DJ, such as scratching, went back underground and were cultivated and built upon by a generation of people who grew up with hip hop, DJs and scratching. By the mid-90s the disappearance of the DJ in hip hop had created a sub-culture which would come to be known as turntablism and which focused entirely on the DJ utilising his turntables and a mixer to manipulate sounds and create music. By pushing the practice of DJing away, hip hop created the grounds for this sub-culture to evolve. The origin of the terms turntablist and turntablism are widely contested and argued about, though over the years some facts have been established by various documentaries (Battlesounds, Doug Pray’s Scratch), books (DJ Culture), conferences (Skratchcon 2000) and interviews in online and printed magazines. These facts are that the origins of the words most likely lay with practitioners on the US West Coast, centered around the San Francisco Bay Area. Some claim that DJ Disk, a member of the Invisibl Skratch Piklz, was the first to coin the term, others claim that DJ Babu, a member of the Beat Junkies, was responsible for coining and spreading the term turntablist after inscribing it on his mixtapes and passing them around. Another claim credits DJ Supreme, 1991 World Supremacy Champion and DJ for Lauryn Hill. The truth most likely lies somewhere in between all these facts. Turntablism is the art of manipulating sounds and creating music using phonograph turntables and a DJ mixer. 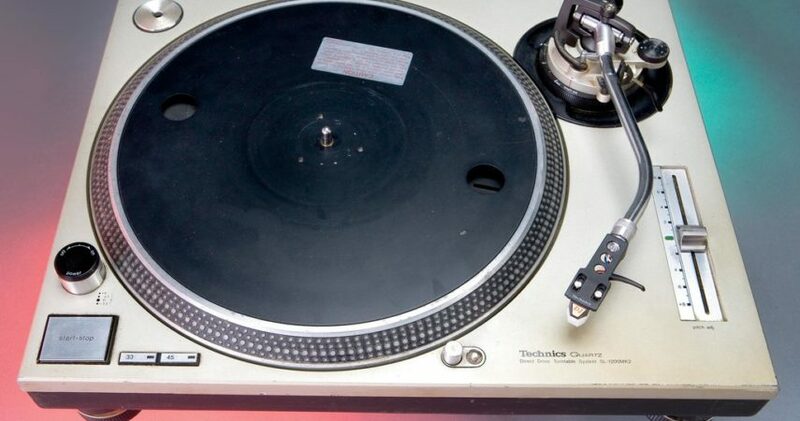 The word ‘turntablist’ was coined in 1995 by DJ Babu to describe the difference between a DJ who just plays records, and one who performs by touching and moving the records, stylus and mixer to manipulate sound. The new term co-occurred with a resurgence of the art of hip hop style DJing in the 1990s. It was around 95, I was heavily into the whole battling thing, working on the tables constantly, mastering new techniques and scratches, and all the while working in a gas station and spending my spare time concentrating on all these things. One day I made this mixtape called ‘Comprehension’, and on there was a track called ‘Turntablism’ which featured Melo-D and D-Styles. And this is part of where this whole thing about turntablist came from. This was a time where all these new techniques were coming out, like flares and stuff, and there were probably 20 people or so, in around California between Frisco and LA, who knew about these. So we worked on them, talked about it and kicked about the ideas that these techniques and new ways of scratching gave us. And what I would do is write ‘Babu the Turntablist’ on tapes I was making at the time, and somehow it got out a bit, the media got hold of it and it blew into this whole thing we now know. But it was really nothing to start with. We’d all talk about these new scratches and how they really started to allow us to use the turntable in a more musical way, how it allowed us to do more musical compositions, tracks, etc. and then we’d think about how people who play the piano are pianists, and so we thought “we’re turntablists in a way, because we play the turntable like these people do the piano or any other instrument”. Beyond that, it was just me writing ‘Babu the Turntablist’, because it was something I did to make my tapes stand out. I’d just get my marker pen out and write it on there. The decade of the 1990s is also important in shaping the turntablist art form and culture as it saw the emergence of pioneering artists (Mix Master Mike, DJ Q-Bert, DJ Quest, DJ Krush, A-Trak, Ricci Rucker, Mike Boo, Pumpin’ Pete,Prime Cuts) and crews (Invisibl Skratch Piklz, Beat Junkies, The Allies, X-Ecutioners), record labels (Asphodel), DJ Battles (DMC) and the evolution of scratching and other turntablism practices. Beat Juggling was invented by Steve Dee, a member of the X-Men (later renamed X-Ecutioners) crew. Beat Juggling essentially involves the manipulation of two identical or different drum patterns on two different turntables via the mixer to create a new pattern. A simple example would be to use two copies of the same drum pattern to evolve the pattern by doubling the snares, syncopating the drum kick, adding rhythm and variation to the existing pattern. From this concept, which Steve Dee showcased in the early 90s at DJ battles, Beat Juggling evolved throughout the decade to the point where by the end of it, it had become an intricate technique to create entirely new ‘beats’ and rhythms out of existing, pre-recorded ones. These were now not just limited to using drum patterns, but could also consist of other sounds – the ultimate aim being to create a new rhythm out of the pre-recorded existing ones. While Beat Juggling is not as popular as scratching due to the more demanding rhythmical knowledge it requires, it has proved popular within DJ Battles and in certain compositional situations. One of the earliest academic studies of turntablism argued for its designation as a legitimate electronic musical instrument—a manual analog sampler—and described turntable techniques such as backspinning, cutting, scratching and blending as basic tools for most hip hop DJs. White’s study suggests the proficient hip hop DJ must possess similar kinds of skills as those required by trained musicians, not limited to a sense of timing, hand-eye coordination, technical competence and musical creativity. This evolution took many shapes and forms: some continued to concentrate on the foundations of the art form and its original links to hip hop culture, some became producers utilising the skills they’d learnt as turntablists and incorporating those into their productions, some concentrated more on the DJing aspect of the art form by combining turntablist skills with the trademark skills of club DJs, while others explored alternative routes in utilising the turntable as an instrument or production tool solely for the purpose of making music – either by using solely the turntable or by incorporating it into the production process alongside tools such as drum machines, samplers, computer software, and so on. The best known examples of turntablism sit within hip hop, which has embraced the genre from its outset. Creating original music using records, turntables and microphones from the early 1970 onward, hip hop pioneers and visionaries developed many of the turntable manipulation techniques that are still central to turntablism today. The story starts with Afrika Bambaata, who in the early ’70s transformed his street gang into the hip hop orientated Universal Zulu Nation. Bambaata became known as the “Master of Records” for the wide variety of music and break records he would blend in a DJ set. One of Bambaata’s contemporaries, Kool Herc, pioneered the breakbeat ‘merry-go-round’ technique. Noticing that dancers would go nuts for drum sections of funk records, Herc began to play these sections back-to-back, elongating the break and ignoring the rest of the track. This breakbeat DJ style set the blueprint for hip hop production. 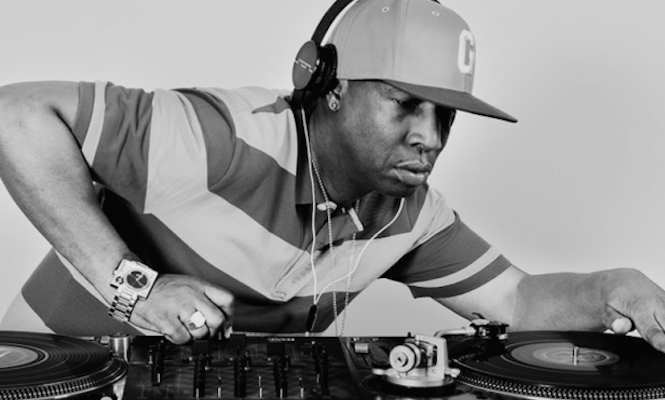 DJ Grandmaster Flash added to the growing body of turntablism tricks with his Quick Mix and Clock theories. With Quick Mix, passages of music are spun back to be repeated, whilst Clock Theory allows the DJ to identify key sections of the record by markings out the record label. Flash also developed punchphasing, in which shorter sound sounds are played over the breakbeat from another record, and backspinning which allows the turntablist to quickly rewind a part of the record. Developed by Barry B (Get Fresh Crew) and Steve Dee (X-Men) in the 1990s, beat juggling also deserves a mention. Here new patterns are created by alternating between two identical records on different turntables. And of course the most celebrated hip-hop technique is scratching, where the musician moves the record back and forth against the stylus whilst also cross-fading on the mixing desk. Legend has it that this was discovered, accidentally, by DJ Theodore in the early ’80s when his turntable practice was interrupted by his mother and his hand subconsciously rocked the record, producing a sound of its own. One of the best-known examples of contemporary turntablism is the DMC World DJ Championships. An annual DJ competition hosted by Disco Mix Club (DMC) since 1985, DJs can enter as individuals or teams and are allocated exactly six minutes to perform original routines. Originally sponsored by Technics, since 2011 the DMC Championship has permitted the use of vinyl emulation systems, alongside traditional vinyl, to balance traditional mixing and the popularity of digital playback. As well as supporting established techniques, digital vinyl systems also include additional tools including those for re-editing, effects, tempo awareness, key-locking and they offer visual feedback as well as the ability to sync up with external hardware. 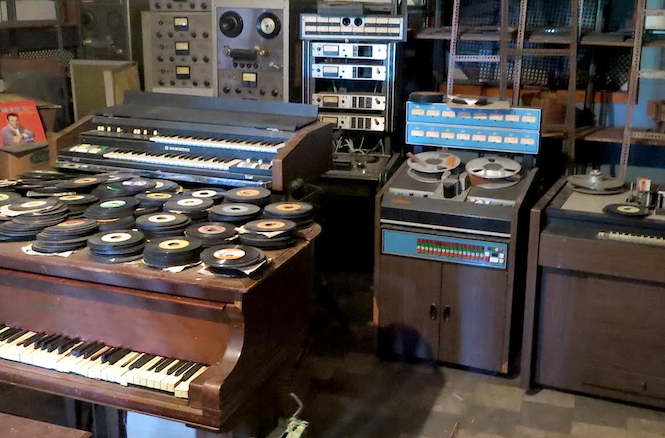 Whilst the manufacturers stress the creative potential of these systems, some feel that artistic experimentation is limited with this new equipment, promoting a future haunted by ghosts of the past.